This Tonti frame SP looks in to be in pretty nice shape. Maybe a perfect winter project for someone here. I just sent the seller an email. Since I don't need another bike the price would have to be really right. As non-running at or near 2K is steep IMHO. That's about as nice a non running bike as I've seen on the block however. Of course, not knowing what the issue is poses problems. I like that bike! 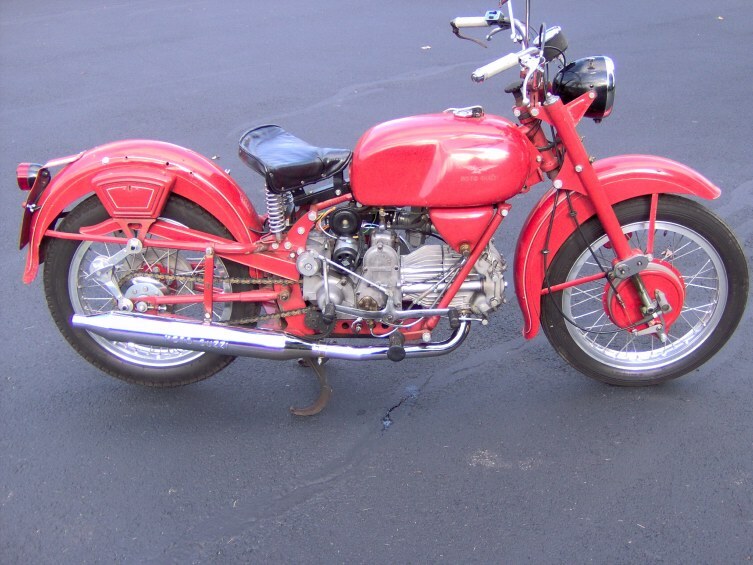 If it were closer to me where I could see it in person, I think I would buy it.I Have always wanted a round head tonti, with that type of fairing. If it was 1500 miles of California I'd be all over it. A 5,000 mile trip with snow for one bike is just a little to far for me. Good thing it's not in Wisconsin If it has compression that's a steal. Talked with the seller and have a meeting lined up. Should be easy to get on the road. Even if you don't. Parting it out would recover the cost of the purchase. Hope you get it on the road. Gotta ask him if he has the lowers. Yep, I'd give 2 large for it in a heartbeat. Had one just like it that I gave 18 hunnerd for back in the day. Great bike. This one's much nicer, has all the stuff. Probably have it running in a couple of hours. Or less..
That's great, hope it works out. You must be the reason he hasn't responded to my e-mail, I e-mailed him about 5pm EST yesterday with no response. Since you don't need another bike and it IS non-running with potentially a HOST of internal problems at that mileage, be assured that it would go to a nice home on this board if you feel like walking away. That's a strange word to use in the context of buying motorcycles! I can't wrap my mind around it somehow. I looked in the Urban Dictionary but couldn't find it. That photo doesn't look right for the time of year. I wonder if Perazzimx got it, or if it might have been a scam. Well the wife an drove down to see the SP late this afternoon and damned if it didn't followed me home. Its in really nice shape. It came with a set of new Pirelli Sport Demon tires, lower fairings, a bunch of misc. Brembo brake parts (NIB), Dyna ignition, sump spacer, Bub exhaust, some sort of progressive rear socks and a copy of Guzziology. Clean clear title in the sellers name. lights all work and the best part is I got it home and after about 30 seconds of intermittently holding the starter button down it ran on the right cylinder. So for now its a semi runner not non-running. Sorry I don't kiss and tell. There were times when I "needed" a project bike to keep my saving account from getting out of control. Possible corrosion on the hot lead under the tank going to the coils. He shoots.. and he SCORES.. Sounds like an easy fix on a great sport tourer..
Congrats, hope it ends up running, as good as it looks..
Quickly checking last night no spark to the left cylinder. I'll have some time this weekend to dig into things and hopefully have it up and running in short order. I'll also change all the fluids (even thought he oil looked new) just so I know when they were donw and with what product. 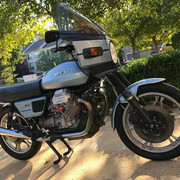 When did Guzzi drop the chrome bores? Would this bike have nikasil? It is a Nikasil engine. At least my '83 SP was. 1000cc roundhead motors never had chrome bores. Most were iron liners. Small block Tonti;'s had Nigasil plated cylinders from the beginning of their manufacture. Wicked nice score Perazzimx14, good for you. 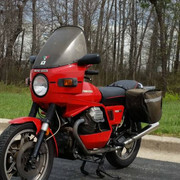 My very first Guzzi was an '80 SP, same livery, rode that bugger for 60+ K miles, sold it to a riding buddy and that was His first Guzzi. Pretty cool. I worked on an '81 German market SP back in 2010 and it had Nigusil, the earliest big-block I'd seen so fitted from the factory.